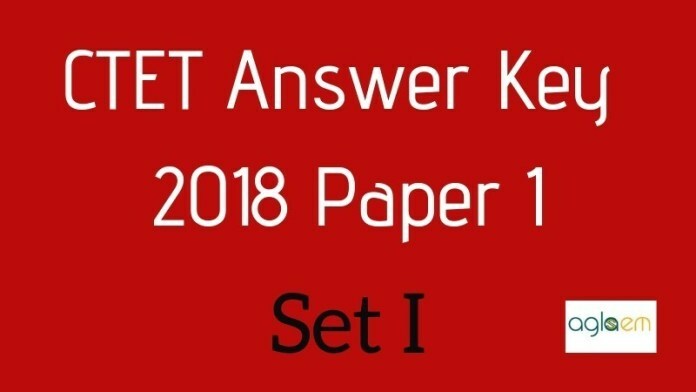 CTET Answer Key 2018 Paper 1 Set I – Now candidates can check CTET Official Answer Key 2018 for Set I. CBSE has released the CTET Set I Answer Key on ctet.nic.in, through login. To access it, candidates need to enter roll number and date of birth. The candidates can calculate their marks using the CTET Answer Key 2018 Paper 1 Set I. The actual marks or CTET Result 2018 shall be announced 06 weeks after the exam date. Hence, until then the candidates can use the CTET Answer Key to calculate their probable score. Check complete details about the CTET Answer Key 2018 Paper 1 Set I from this page. Latest: CTET Official Paper 1 Set I Answer Key and Question Paper has been released. Get it from below. CBSE has released CTET Official Answer Key 2018 for Paper 1 with OMR sheet. Officially released answer key is also available for all the other sets. Candidates can challenge it by paying Rs. 1000 per objection. Use the link below to download CTET 2018 Answer Key and OMR. Click Here to raise objections against CTET 2018 Answer Key. Get here CTET Answer Key 2018 for other sets. The Answer Key for CTET Paper 1 2018 will help the candidates in predicting and estimating their marks in the examination. Only official answer key will be taken into consideration for calculating the marks. For more information regarding CTET Answer Key 2018 Paper 1 Set I check the below-mentioned schedule. How to Check CTET Answer Key 2018 For Paper 1? After viewing the Answer Key candidates should take the print out of it for future reference. Candidate can follow the given below steps for checking the CTET Answer Key 2018. Thereafter login page will appear. Enter all the asked details in the login page. After entering the asked details, hit the enter button. Thereafter, Answer Key page will appear on the screen. How To Calculate Marks From CTET Answer Key 2018 For Paper 1 Set I? From the downloaded CTET Answer Key 2018, the candidates can check their answers that whether the question which he/she has answered in the CTET 2018 is correct or not and by following this procedure candidate can predict their scores in the examination. But while calculating the marks please follow the marking criteria and see the exam pattern then only the candidate can estimate the correct scores. Marking Scheme and Exam Pattern is given below. For each incorrect answer, 0 Marks will be deducted. After the successful conduction of the CTET 2018 examination result for that will be declared. The CTET Result 2018 will be declared by the board at the official website. By entering the login credential at the login page candidates will be able to check their result. The result will contain the name and roll number of the qualified candidates. The candidates whose name will be there in the final result those will be given the teacher eligibility certificate. The validity of the certificate will be of 07 years from the result declaration date. Central Board of Secondary Education (CBSE) conducts the CTET entrance examination. CBSE conducts the two CTET 2018 Exams that are Paper I and II. Paper I is for Primary Level Teacher (Class 1 to 5), and Paper II is for Upper Primary Level (Class 6 to 8). The candidates who have the CTET certificate will easily get the Teacher’s job in Government School, Semi Government and Private Schools.